List of Digimon using original (Japanese) names. For names from the dub, see List of Dub Names. Please note that names are likely to change on an almost weekly basis due to official romanizations released by Digimon Reference Book. As of July 30th, 2018, there are 1,304 Digimon listed on this page. Agumon (2006 Anime Version) アグモン（２００６アニメ版） 2005 Digimon Next: "Welcome to the Digimon Net Game!!" Agumon: Burst Mode アグモン バーストモード 2007 Digimon Savers: "The Perfect Ending! Farewell, Leader of Fights"
Aircraft Carrier Whamon 空母ホエーモン 2011 Digimon Xros Wars: "Xros Wars!! Prelude to the End!!" Algomon アルゴモン 2006 Digimon Savers The Movie: Ultimate Power! Activate Burst Mode!! Apollomon Darkness Mode アポロモンダークネスモード 2011 Digimon Xros Wars: "Taiki VS Yuu, The Confrontation of the Boy Generals!!" 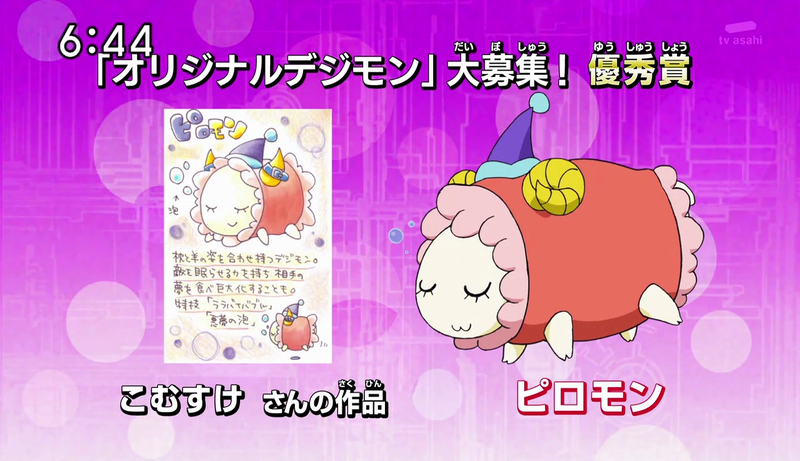 Apollomon Whispered アポロモン・ウィスパード 2011 Digimon Xros Wars: "The Final Kingdom, The Shining Sun's Bright Land"
Arkadimon Baby アルカディモン幼年期 2000 Digimon Adventure V-Tamer 01: "Stranger"
Arkadimon Child アルカディモン成長期 2001 Digimon Adventure V-Tamer 01: "Neo's Charge!!!" Arkadimon Adult アルカディモン成熟期 2001 Digimon Adventure V-Tamer 01: "Holy War"
Arkadimon Perfect アルカディモン完全体 2001 Digimon Adventure V-Tamer 01: "The Legendary Power, Digimental"
Arkadimon Ultimate アルカディモン究極体 2001 Digimon Adventure V-Tamer 01: "Earthquake! Demon Castle!!" Arresterdramon アレスタードラモン 2011 Digimon Xros Wars: "Us, the Digimon Hunters!" Arresterdramon Superior Mode アレスタードラモンスペリオルモード 2012 Digimon Xros Wars: "Golden Insect! The Mystery of Metallife Kuwagamon"
Arresterdramon Superior Mode (Brave Snatcher) アレスタードラモンスペリオルモード 2012 Digimon Xros Wars: "Burn Up, Tagiru! The Glorious Digimon Hunt!" Atlur Ballistamon アトラーバリスタモン 2011 Digimon Xros Wars: "Xros Warrior!! The Released Demon!!" Baalmon バアルモン 2010 Digimon Xros Wars: "Taiki, Go to Another World!" Bagramon Archangel Form N/A 2012 Digimon Xros Wars: "Xros Miracle!! Reel in a Sliver of Hope!" 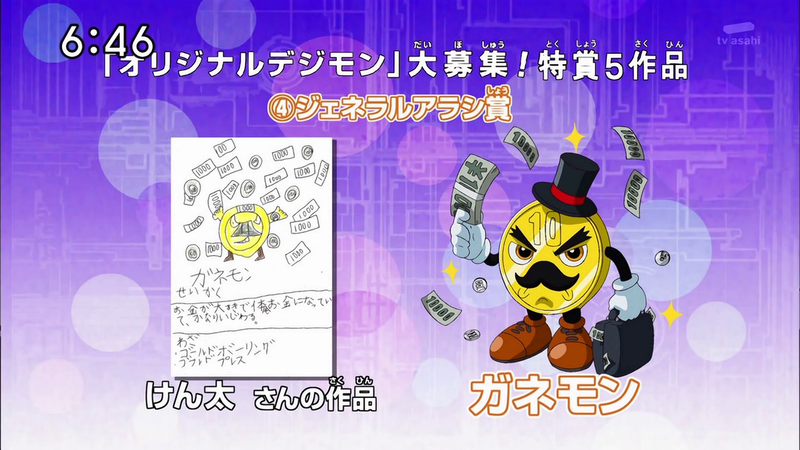 Balli Bastemon バリバステモン 2011 Digimon Xros Wars: "Shinobi Zone, The Comical Ninja Battle!" Ballistamon MC バリスタモンＭＣ 2010 Digimon Xros Wars: "Xros Girls!! The Mysterious Beauty, Nene!!" Ballistamon SR バリスタモンＳＲ 2010 Digimon Xros Wars: "Xros Pride!! A Warrior's Pride!!" Bancho Leomon: Burst Mode バンチョーレオモン バーストモード 2007 Digimon Savers: "Shock! The Truth about Bancho Leomon"
Battle Armament Trailmon 戦闘武装トレイルモン 2006 Digimon Next: "The City of Light, Light City!" Beelzebumon + Revolmon N/A 2011 Digimon Xros Wars: "Shoutmon, Proof of a King!" Beelzebumon + Starmons N/A 2010 Digimon Xros Wars: "Legendary Deckerdramon, Stir!" Bio Coatlmon バイオクアトルモン 2006 Digimon Savers: "Masaru's Memory is Erased, The Lost Bond"
Bio Darkdramon バイオダークドラモン 2006 Digimon Savers: "Final Decisive Battle! Kouki, Ultimate Evolution" "
Bio Lotusmon バイオロトスモン 2006 Digimon Savers: "Genius Showdown! Thoma VS Nanami"
Bio Spinomon バイオスピノモン 2006 Digimon Savers: "The Fierce Attack of Kurata's Army Corps, Protect the Holy Capital"
Bio Stegomon バイオステゴモン 2006 Digimon Savers: "Masaru's Memory is Erased, The Lost Bond"
Bio Thunderbirmon バイオサンダーバーモン 2006 Digimon Savers: "Masaru's Memory is Erased, The Lost Bond"
Bishop Chessmon (Black) ビショップチェスモン（黒） 2011 Digimon Xros Wars: "Bagra Brothers, The Bond of Darkness!" Black Gaogamon ブラックガオガモン 2006 Digimon Next: "The Other Overseer!" Black Seraphimon ブラックセラフィモン 2002 Digimon Frontier: "Takuya's Fusion Evolution, Aldamon's Explosive Attack!" Black Shoutmon X7 ブラックシャウトモンＸ７ 2011 Super Digica Taisen: "The Seventh Act EX Challenge: BlackShoutmon X7"
Blastmon ブラストモン 2010 Digimon Xros Wars: "Taiki, Go to Another World!" Bokomon ボコモン 2002 Digimon Frontier: "The Legendary Warrior! Agnimon of Fire"
Bombmon ボムモン 2010 Digimon Xros Wars: "Xros Rival!! The Blue Hound Kiriha!!" Callismon カリスモン 2002 Digimon Adventure V-Tamer 01: "Hope On"
Cannonbeemon (Aircraft Carrier) キャノンビーモン （空母型） 2007 Digimon Next: "Break Through the Firewall!" Chibick Sword チビックソード 2010 Digimon Xros Wars: "Xros Pride!! A Warrior's Pride!!" Chibi Kamemon チビカメモン 2010 Digimon Xros Wars: "Island Zone, Upheaval"
Chibickmon チビックモン 2010 Digimon Xros Wars: "DigiMemory, Shine"
Chibimon チビモン 2000 Digimon Adventure 02: "Digital Gate Open"
Chikurimon チクリモン 2010 Digimon Xros Wars: "Xrosroad!! The Boys' Paths Cross"
Citramon N/A 2007 Digimon Data Squad: "A Birthday Kristy Will Never Forget!" Culumon クルモン 2001 Digimon Tamers: "Guilmon is Born! The Digimon that I Created"
Cutemon キュートモン 2010 Digimon Xros Wars: "Shoutmon, Roar!" Damemon ダメモン 2010 Digimon Xros Wars: "Stingmon, The Hero of the Digimon Jungle"
Darcmon ダルクモン 2002 Digimon Frontier: Revival of the Ancient Digimon!! Dark Knightmon (Bagramon) ダークナイトモン 2011 Digimon Xros Wars: "Approach! The Human World's Last Day, D5!!" Dark Knightmon (Blastmon) N/A 2011 Digimon Xros Wars: "Xros Warrior!! The Released Demon!!" Dark Knightmon (Duskmon) N/A 2011 Digimon Xros Wars: "Xros Evolution!! The Guide to Miracles!!" Dark Knightmon (Gulfmon) N/A 2011 Digimon Xros Wars: "Xros Alliance! The Final Battle in Odaiba!!" Dark Knightmon (Lilithmon) N/A 2011 Digimon Xros Wars: "Xros Stars!! Like a Falling Star!!" Dark Volumon ダークボリューモン 2011 Digimon Xros Wars: "Cheerful Pirate, Appear! The Voyage to Gold Land!!" Deadly Tuwarmon デッドリーツワーモン 2011 Digimon Xros Wars: "Brother, Why!? The Nightmare of the Enemy General, Yuu"
Deadly Tuwarmon Hell Mode デッドリーツワーモン ヘルモード 2011 Digimon Xros Wars: "Taiki VS Yuu, The Confrontation of the Boy Generals!!" 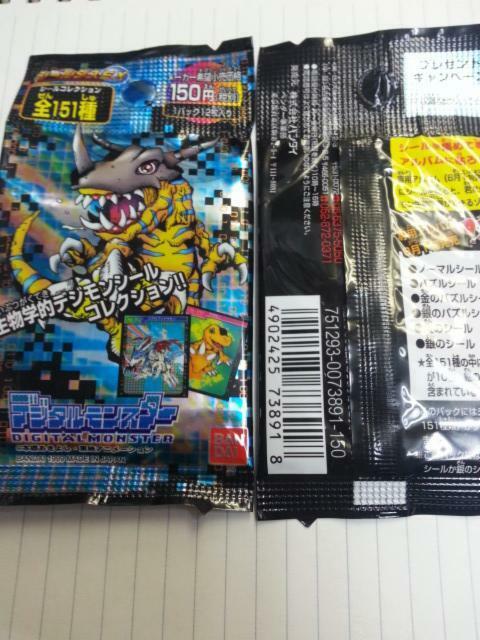 Deckerdramon Float Mode デッカードラモン フロートモード 2011 Digimon Xros Wars "Cheerful Pirate, Appear! The Voyage to Gold Land!!" Demon デーモン 1999 Digimon Adventure V-Tamer 01: "Folder Continent's Military History"
Dominimon ドミニモン 2002 Digimon Adventure V-Tamer 01: "Continuing Courage"
Dondokomon ドンドコモン 2010 Digimon Xros Wars: "Shoutmon, Roar!" Dorbickmon ドルビックモン 2011 Digimon Xros Wars: "To a New World! The Fire Rage General's Dragon Land"
Dorbickmon Darkness Mode ドルビックモンダークネスモード 2011 Digimon Xros Wars: "To a New World! The Fire Rage General's Dragon Land"
Dorbickmon Darkness Mode (Dragon Army) N/A 2011 Digimon Xros Wars: "Stand Up, Kihira! The Xros Heart Rescue Strategy"
Dorbickmon Darkness Mode + Flare Lizarmon N/A 2011 Digimon Xros Wars: "To a New World! The Fire Rage General's Dragon Land"
Dorulumon + Starmons N/A 2010 Digimon Xros Wars: "Stingmon, The Hero of the Digimon Jungle"
Dracomon + Cyberdramon N/A 2011 Digimon Xros Wars: "Glorious DigiXros, Seize it! Our Future!!" Duftmon ドゥフトモン 2007 Digimon Savers: "Power Equals Justice! Beast Knight Duftmon"
Etemon Chaos エテモンカオス 1999 Digimon Adventure: "Perfect Evolution! Metal Greymon"
Falcomon (2006 Anime Version) ファルコモン（２００６アニメ版） 2006 Digimon Savers: "I Will Protect Chika! Piyomon's Decision!" Fladramon フレイドラモン 2000 Digimon Adventure 02: "The One who Inherits Courage"
G-Cutemon グレイテストキュートモン 2011 Digimon Xros Wars: "X7 of Bonds! The Great Battle with Gravimon!!" Gaossmon ガオスモン 2010 Digimon Xros Wars: "Xros Rival!! The Blue Hound Kiriha!!" Gattai Ancient Volcamon 合体エンシェントボルケーモン 2010 Digimon Xros Wars: "Dorulumon, Run Like the Wind!" Gattai Lilithmon 合体リリスモン 2011 Digimon Xros Wars: "Brother, Why!? 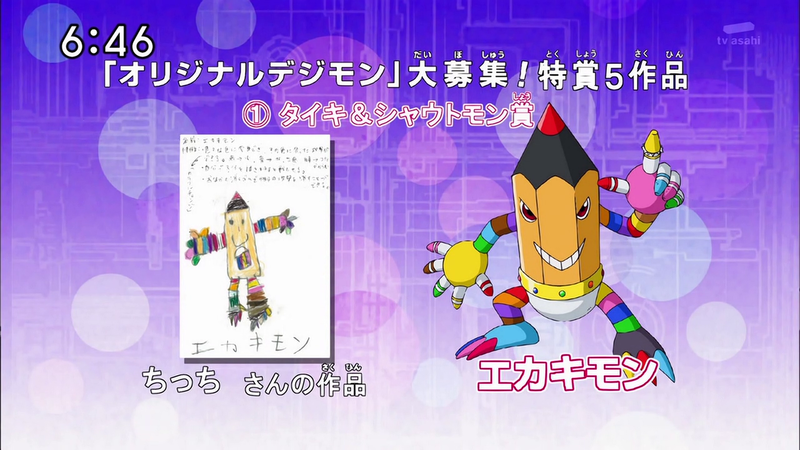 The Nightmare of Enemy General Yuu"
Giga Breakdramon ギガブレイクドラモン 2011 Digimon Xros Wars: "Robot Club's Dream, Pinochimon's Temptation"
Giga Waru Monzaemon ギガワルもんざえモン 2011 Digimon Xros Wars: "Sweets Zone! The Sweet-toothed Digimon Battle!" Gigasmon ギガスモン 2002 Digimon Frontier: "The Five Legendary Warriors VS The New Warrior!" Gizmon: AT ギズモン：ＡＴ 2006 Digimon Savers: "The Heartless Past Revealed! Gizmon: AT"
Gizmon: XT ギズモン：ＸＴ 2006 Digimon Savers: "Smash Kurata's Ambition, Yatagaramon takes Flight"
Golem Jiji Kamemon ゴーレムジジカメモン 2011 Digimon Xros Wars: "Glorious DigiXros, Seize it! Our Future!!" Grademon (Vice) グレイドモン（悪） 2011 Digimon Xros Wars: "Taiki and Kiriha VS the Bagra Army, A Complete Showdown!" Grand Generamon グランドジェネラモン 2011 Digimon Xros Wars: "Resurrect! The Appearance of All Seven Death Generals!!" Grandis Kuwagamon Honey Mode グランディスクワガーモンハニーモード 2011 Digimon Xros Wars: "Power is Being Sucked Up! The Hunters of Honey Land"
Gravimon グラビモン 2011 Digimon Xros Wars: "To a New World! The Fire Rage General's Dragon Land"
Gravimon Darkness Mode グラビモンダークネスモード 2011 Digimon Xros Wars: "X7 of Bonds! The Great Battle with Gravimon!!" Greymon (2010 Anime Version) グレイモン 2010 Digimon Xros Wars: "Xrosroad!! The Boys' Paths Cross"
Guidemon ガイドモン 2005 Digimon Next: "Welcome to the Digimon Net Game!!" Gumdramon ガムドラモン 2011 Digimon Xros Wars: "Us, the Digimon Hunters!" Hermmon ヘルムモン 2002 Digimon Adventure V-Tamer 01: "DELETE"
Hi Mugendramon ハイムゲンドラモン 2010 Digimon Xros Wars: "Warrior Beelzebumon, Dance!" Hi-Vision Monitamon ハイビジョンモニタモン 2011 Digimon Xros Wars: "Dunce Monitamons, Keep at it!" Hippogriffomon ヒポグリフォモン 2002 Digimon Frontier: Revival of the Ancient Digimon!! Holy Angemon ホーリーエンジェモン 1998 Digimon Adventure V-Tamer 01: "Reversal Combination"
Holy Angemon: Priest Mode ホーリーエンジェモン：神官形態 1998 Digimon Adventure V-Tamer 01: "Reversal Combination"
Hustle Nanimon ハッスルナニモン 2010 Digimon Xros Wars: "Xros Hustle!! The Great Digimon Athletic Meet!!" Ice Devimon Enhancement Absorbent アイスデビモン 強化吸収体 2010 Digimon Xros Wars: "Taiki, Become a Knight!" Ice Devimon Daipenmon Enhancement Absorbent アイスデビモン ダイペンモン 強化吸収体 2010 Digimon Xros Wars: "Xros Heart, Burn!" Iguneetmon イグニートモン 2011 Digimon Xros Wars: "Power is Being Sucked Up! The Hunters of Honey Land"
Impmon インプモン 2001 Digimon Tamers: "Meaning of Partner - Renamon Evolves!" Indaramon インダラモン 2001 Digimon Tamers: "We Would Like to Become Strong! Rise, Impmon!" Infermon インフェルモン 2000 Digimon Adventure: Our War Game! Jäger Dorulumon イエーガードルルモン 2011 Digimon Xros Wars: "Xros Warrior!! The Released Demon!!" Jet Mervamon ジェットメルヴァモン 2011 Digimon Xros Wars: "Our Power is Being Drained! The Hunters of Honey Land"
Jiji Shoutmon ジジシャウトモン 2010 Digimon Xros Wars: "Shinobi Zone, The Comical Ninja Battle!" Jokermon ジョーカーモン 2012 Digimon Xros Wars: "Amusement Park of Dreams, DigimonLand!" Kamemon カメモン 2006 Digimon Savers: "I am Masaru! Cockatrimon Strikes"
King Whamon キングホエーモン 2010 Digimon Xros Wars: "DigiMemory, Shine!" Knightmon Wise Sword Mode ナイトモンワイズソードモード 2011 Digimon Xros Wars: "Glorious DigiXros, Seize it! Our Future!!" Kodokugumon コドクグモン 1999 Digimon Adventure: "The Chase! Hurry to Japan"
Kozenimon コゼニモン 2011 Digimon Xros Wars: "The Digimon Hunt is Thriving! The Virtuoso Hunter of the Shopping District!!" Kudamon (2006 Anime Version) クダモン（２００６アニメ版） 2006 Digimon Savers: "I am Masaru! Cockatrimon Strikes"
Kumbhiramon クンビラモン 2001 Digimon Tamers: "Juri's Partner!? My Lord Leomon"
Kuramon クラモン 2000 Digimon Adventure: Our War Game! Luminamon ルミナモン 2012 Digimon Xros Wars: "Xros Miracle!! Reel in a Sliver of Hope!!" Luminamon (Nene Version) ルミナモン（ネネＶｅｒ.） 2012 Digimon Xros Wars: "Xros Miracle!! Reel in a Sliver of Hope!" Lykamon リュカモン 2002 Digimon Adventure V-Tamer 01: "DELETE"
Mach Leomon マッハレオモン 2010 Digimon Xros Wars: "Xrosroad!! The Boys' Paths Cross"
Mad Leomon マッドレオモン 2010 Digimon Xros Wars: "Taiki, Go to Another World!" Mad Leomon (Final Mode) マッドレオモン（ファイナルモード） 2010 Digimon Xros Wars: "Rival Kiriha, Appear!" Mad Leomon (Orochi Mode) マッドレオモン（オロチモード） 2010 Digimon Xros Wars: "Shoutmon, Roar!" Mad Leomon: Armed Mode マッドレオモン：アームドモード 2010 Digimon Xros Wars: "Taiki, Go to Another World!" Mail Birdramon メイルバードラモン 2010 Digimon Xros Wars: "Xrosroad!! The Boys' Paths Cross"
Mail Birdramon + Golemon N/A 2010 Digimon Xros Wars: "Rival Kiriha, Appear!" Majiramon マジラモン 2001 Digimon Tamers: "Enter the Digital World! Goodbye to Our City"
Majuu Lilithmon 魔獣リリスモン 2011 Digimon Xros Wars: "Beelzebumon, Vanish into the Light!" Makuramon マクラモン 2001 Digimon Tamers: "We Would Like to Become Strong! Rise Impmon"
Megidramon メギドラモン 2001 Digimon Tamers: "The Kindhearted Hero - Leomon Dies!" Meicoomon メイクーモン 2015 Digimon Adventure tri. - "Reunion"
Meicoomon's Unnamed Baby Form N/A 2016 Shabette Concier App Skin: "Mytserious DigiTama"
Meicoomon's Unnamed Child Form N/A 2016 Shabette Concier App Skin: "Mytserious DigiTama"
Mervamon メルヴァモン 2011 Digimon Xros Wars: "Power is Being Sucked Up! The Hunters of Honey Land"
Mervamon Wide Hi-Vision Sword メルヴァモン ワイドハイビジョンソード 2011 Digimon Xros Wars: "Brother, Why!? The Nightmare of Enemy General Yuu"
Metal Greymon メタルグレイモン 1999 Digivice Version 1 or Digimon Adventure: "Perfect Evolution! Metal Greymon"
Metal Greymon (2010 Anime Version) メタルグレイモン 2010 Digimon Xros Wars: "Shoutmon, Roar!" Metamormon メタモルモン 2002 Digimon Adventure V-Tamer 01: "Frontier Generation"
Mihiramon ミヒラモン 2001 Digimon Tamers: "Stand Up Tamer! The Super Evolved Megalo Growmon"
Monimon モニモン 2010 Digimon Xros Wars: "Xrosroad!! The Boys' Paths Cross"
Monitamon モニタモン 2010 Digimon Xros Wars: "Xrosroad!! The Boys' Paths Cross"
Murmukusmon ムルムクスモン 2002 Digimon Frontier: Revival of the Ancient Digimon!! Mush-Upped Mach Leomon マッシュアップド マッハレオモン 2010 Digimon Xros Wars: "Xros Heart! Our "King"!!" Neamon ネーモン 2002 Digimon Frontier: "The Legendary Warrior! Agnimon of Fire"
Nefertimon ネフェルティモン 2000 Digimon Adventure 02: "Digimental Up"
Neo Devimon ネオデビモン 2002 Digimon Adventure V-Tamer 01: "Digimon Tamer"
Neo Vamdemon ネオヴァンデモン 2011 Digimon Xros Wars: "To a New World! The Fire Rage General's Dragon Land"
Neo Vamdemon + Devimon + Lady Devimon N/A 2011 Digimon Xros Wars: "Spine-chilling! The Moonlight General's Vampire Land"
Neo Vamdemon Darkness Mode ネオヴァンデモンダークネスモード 2011 Digimon Xros Wars: "Spine-chilling! The Moonlight General's Vampire Land"
Neo Vamdemon Darkness Mode + Shoutmon N/A 2011 Digimon Xros Wars: "Don't Die, Greymon! The Birth of Shoutmon DX"
Nyaromon ニャロモン 1999 Digimon Adventure: "The Bond of Destiny! Tailmon"
Ochi Musyamon オチムシャモン 2010 Digimon Xros Wars: "Xros Rival!! The Blue Hound Kiriha!!" Olegmon オレーグモン 2011 Digimon Xros Wars: "To a New World! The Fire Rage General's Dragon Land"
Omega Shoutmon オメガシャウトモン 2011 Digimon Xros Wars: "A New Journey!! The Great Tokyo Showdown!!" Omegamon: Merciful Mode オメガモン：マーシフルモード 2018 Digimon Adventure tri. - "Our Future"
Ordinemon オルディネモン 2017 Digimon Adventure tri. - "Coexistence"
Ornismon オニスモン 2002 Digimon Frontier: Revival of the Ancient Digimon!! Pajramon パジラモン 2001 Digimon Tamers: "Chase the Blue Card! Lightning Rapidmon"
Panbachimon パンバチモン 2010 Digimon Xros Wars: "Zone Collapse! The Sparking Taiki and Kiriha!" Panimon パニモン 2002 Digimon Adventure V-Tamer 01: "DELETE"
Parallelmon パラレルモン 2001 Digimon Adventure V-Tamer 01: "Double Tamer!! The Great Super-dimensional Battle!!" Pawn Chessmon (Black) ポーンチェスモン (黒) 2006 Digimon Savers: "I am Masaru! Cockatrimon Strikes"
Pawn Chessmon (White) ポーンチェスモン （白） 2006 Digimon Savers: "I am Masaru! Cockatrimon Strikes"
Pawn Gaossmon ポーンガオスモン 2011 Digimon Xros Wars: "Glorious DigiXros, Seize it! Our Future!!" Pawn Shoutmon ポーンシャウトモン 2011 Digimon Xros Wars: "Shinobi Zone, The Comical Ninja Battle!" Peckmon ペックモン 2006 Digimon Next: "Black-Winged Knight!" Petit Mamon プチマモン 2001 Digimon Adventure V-Tamer 01: "Earthquake! Demon Castle!!" Pickmon ピックモン 2010 Digimon Xros Wars: "Taiki Goes to Another World!" Pickmons Slingshot ピックモンズパチンコ 2010 Digimon Xros Wars: "Shoutmon, Roar!" Pico Devimon ピコデビモン 1999 Digimon Adventure V-Tamer 01: "5 Trials!!" Pipimon ピピモン 2001 Digimon Adventure 02: "Our Digital World"
Plotmon プロットモン 1999 Digimon Adventure: "The Bond of Destiny! Tailmon"
Poromon ポロモン 2000 Digimon Adventure 02: "Digital Gate Open"
Proto Gizmon プロトギズモン 2006 Digimon Savers: "The DATS Team is Annihilated?! The Clash with Mercurymon"
Pyocomon ピョコモン 1999 Digimon Adventure: "Adrift? The Island of Adventure!" Quartzmon クオーツモン 2012 Digimon Xros Wars: "A Golden Bug! The Mystery of Metallife Kuwagamon"
Raguelmon ラグエルモン 2017 Digimon Adventure tri. - "Coexistence"
Rampage Greymon ランページグレイモン 2011 Digimon Xros Wars: "Xros Darkness!! Conspiracy's Dark Fortress!!" Raptor Sparrowmon ラプタースパロウモン 2011 Digimon Xros Wars: "Xros Warrior!! The Released Demon!!" Rare Star Sword レアスターソード 2010 Digimon Xros Wars: "Rival Kiriha, Appear!" Regulumon レグルモン 2002 Digimon Adventure V-Tamer 01: "Continuing Courage"
Reverse Weddinmon リバース・ウェディンモン 2010 Digimon Xros Wars: "Xros Sweets!! The Girls' Sweet Trap!?" Revolmon + Dorulu Cannon + Starmons N/A 2011 Digimon Xros Wars: "Glorious DigiXros, Seize it! Our Future!!" Rosemon: Burst Mode ロゼモン：バーストモード 2007 Digimon Savers: "Power Equals Justice! Beast Knight Duftmon"
Sakuteki Monitamon サクテキモニタモン 2010 Digimon Catch Ganbare Monitamon! Sandiramon サンティラモン 2001 Digimon Tamers: "Giant Snake Appearance! Great Edo Line, Great Panic"
Scud Missimon スカッドミサイモン 2010 Digimon Xros Wars: "Xros Heart! Our "King"!!" Sethmon Wild Mode セトモンワイルドモード 2011 Digimon Xros Wars: "The Final Kingdom, The Shining Sun's Bright Land"
Shademon シェイドモン 2011 Digimon Xros Wars: "Xros Darkness!! Conspiracy's Dark Fortress!!" Shademon (Nene Version) N/A 2011 Digimon Xros Wars: "Xros Darkness!! Conspiracy's Dark Fortress!!" Shine Greymon: Ruin Mode シャイングレイモン ルインモード 2006 Digimon Savers: "The Day of Parting, The Strongest Enemy - Thoma!" Shooting Starmon シューティングスターモン 2011 Digimon Xros Wars: "Xros Stars! Like a Falling Star!!" Shortmon ショートモン 2010 Digimon Xros Wars: "Xros Sweets!! The Girls' Sweet Trap!?" 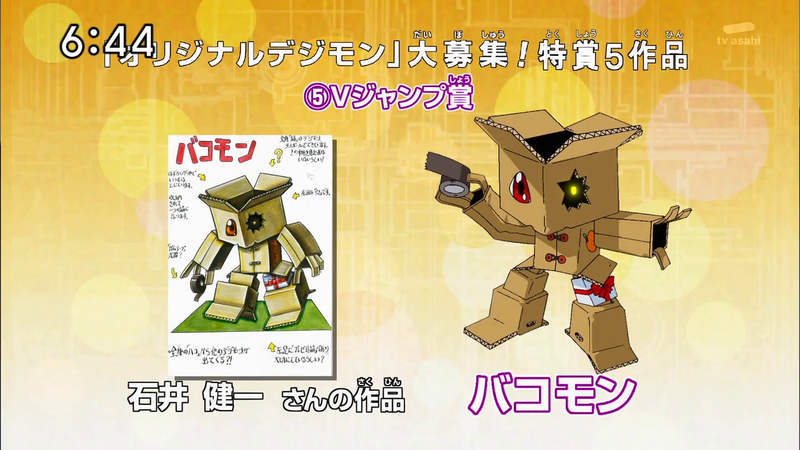 ShouCutemon シャウキュートモン 2011 Digimon Xros Wars: "Shinobi Zone, The Comical Ninja Battle!" Shoutmon DX シャウトモンＤＸ 2011 Digimon Xros Wars: "Don't Die, Greymon! 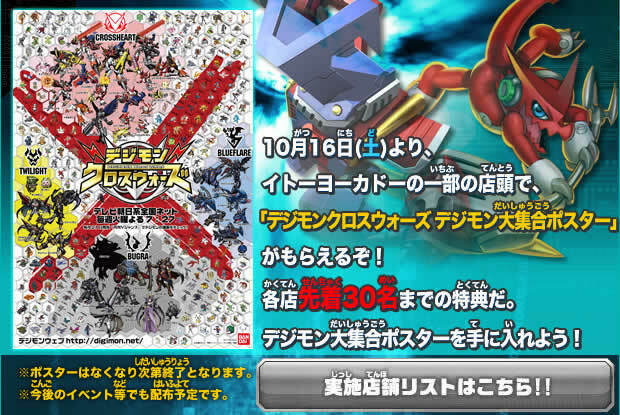 The Birth of Shoutmon DX"
Shoutmon EX6 シャウトモンＥＸ６ 2011 Digimon Xros Wars: "Xros Stars! Like a Shooting Star!!" Shoutmon SH シャウトモンＳＨ 2010 Digimon Xros Wars: "Xros Pride!! A Warrior's Pride!!" Shoutmon X2 シャウトモンＸ２ 2010 Digimon Xros Wars: "Xrosroad!! The Boys' Paths Cross"
Shoutmon X2 (Incomplete X4) シャウトモンＸ２ (不完全Ｘ４) 2010 Digimon Xros Wars: "Taiki, Go to Another World!" Shoutmon X2 Plus M シャウトモンＸ２ プラス Ｍ 2010 Digimon Xros Wars: "Island Zone, An Upheaval!" Shoutmon X3 シャウトモンＸ３ 2010 Digimon Xros Wars: "Rival Kiriha, Appear!" Shoutmon X4 シャウトモンＸ４ 2010 Digimon Xros Wars: "Xrosroad!! The Boys' Paths Cross"
Shoutmon X4K シャウトモンＸ４Ｋ 2010 Digimon Xros Wars: "Xros Heart, Burn!" Shoutmon X6 シャウトモンＸ６ 2011 Digimon Xros Wars: "Xros Alliance! The Final Battle in Odaiba!!" Shoutmon X7 Superior Mode シャウトモンＸ７スペリオルモード 2011 Digimon Xros Wars: "Glorious DigiXros, Seize it! Our Future!!" Shoutmon + Star Sword シャウトモン＋スターソード 2010 Digimon Xros Wars: "Taiki, Go to Another World!" Sinduramon シンドゥーラモン 2001 Digimon Tamers: "Protect the Light of the Town! Dangerous Camp of the Digimon"
Sparrowmon スパロウモン 2010 Digimon Xros Wars: "Xros Girls!! The Mysterious Beauty Nene!!" Sparrowmon AB スパロウモン（アフター バー ナー） 2011 Digimon Xros Wars: "Xros Friend!! The Location of Trust"
Splashmon スプラッシュモン 2011 Digimon Xros Wars: "To a New World! The Fire-fury General's Dragon Land"
Splashmon Darkness Mode スプラッシュモンダークネスモード 2011 Digimon Xros Wars: "The Xros Heart Break-up Crisis! The Water-tiger General's Devious Trap"
Star Axe スターアックス 2010 Digimon Xros Wars: "Island Zone, Upheaval"
Star Sword スターソード 2010 Digimon Xros Wars: "X4, Crisis Breakthrough!" Star Wheel スターホイール 2010 Digimon Xros Wars: "Xros Pride!! A Warrior's Pride!!" Super Dark Knightmon スーパーダークナイトモン 2010 Digimon Xros Wars: "Showdown! Dark Knightmon VS Xros Heart!" Tactimon タクティモン 2010 Digimon Xros Wars: "Taiki, Go to Another World!" Togemon トゲモン 1999 Digimon Adventure: "Palmon, Raging Evolution!" Trailmon トレイルモン 2002 Digimon Frontier: "The Legendary Warrior! Agnimon of Fire"
Trailmon Angler トレイルモン アングラー 2002 Digimon Frontier: "The Legendary Warrior! Agnimon of Fire"
Trailmon Ball トレイルモン ボール 2002 Digimon Frontier: Revival of the Ancient Digimon!! Trailmon Battle Form トレイルモン戦闘フォーム 2006 Digimon Next: "The City of Light, Light City!" Trailmon Buffalo トレイルモン バッファロー 2002 Digimon Frontier: "Thunder Power Shaking the Ground, Blitzmon!" Trailmon C-89 トレイルモン Ｃ－８９型 2006 Digimon Next: "Greymon vs. Peckmon!" Trailmon Franken トレイルモン フランケン 2002 Digimon Frontier: "Bullying is Unforgivable! Evolve, Chackmon of Ice"
Trailmon Kettle トレイルモン ケトル 2002 Digimon Frontier: "Awaken Seraphimon! The Secret of The Ten Legendary Warriors"
Trailmon Mole トレイルモン モール 2002 Digimon Frontier: "My Painful Kick! Female Warrior Fairimon"
Trailmon Raccoon Dog トレイルモン ラクーンドッグ 2002 Digimon Frontier: "Choo-Choo! The Great Trailmon Race"
Trailmon Worm トレイルモン ワーム 2002 Digimon Frontier: "The Legendary Warrior! Agnimon of Fire"
Trailmon of Darkness 闇のトレイルモン 2002 Digimon Frontier: "The Five Legendary Warriors Annihilated!? Terrifying Dark Power!" Troopmon トループモン 2010 Digimon Xros Wars: "Xrosroad!! The Boys' Paths Cross"
Tuwarmon ツワーモン 2011 Digimon Xros Wars: "Shoutmon, Proof of a King!" Tyutyumon チューチューモン 2010 Digimon Xros Wars: "Stingmon, The Hero of the Digimon Jungle"
Upamon ウパモン 2000 Digimon Adventure 02: "Digital Gate Open"
V-dramon ブイドラモン 1998 Digimon Adventure V-Tamer 01: "100% Tamer!!" V-mon ブイモン 2000 Digimon Adventure 02: "The One who Inherits Courage"
Vajramon ヴァジラモン 2001 Digimon Tamers: "Chase the Blue Card! Lightning Rapidmon"
Venom Vamdemon Undead ヴェノムヴァンデモンアンデッド 2017 Super Evolution Stage "Digimon Adventure tri. ~Adventure of August 1~"
Vikaralamon ヴィカラーラモン 2001 Digimon Tamers: "Vikaralamon Appears! Protect Our Town!" Weddinmon ウェディンモン 2010 Digimon Xros Wars: "Xros Sweets!! The Girls' Sweet Trap!?" White Lopmon 白いロップモン 2011 Digimon Xros Wars: "Don't Die, Greymon! 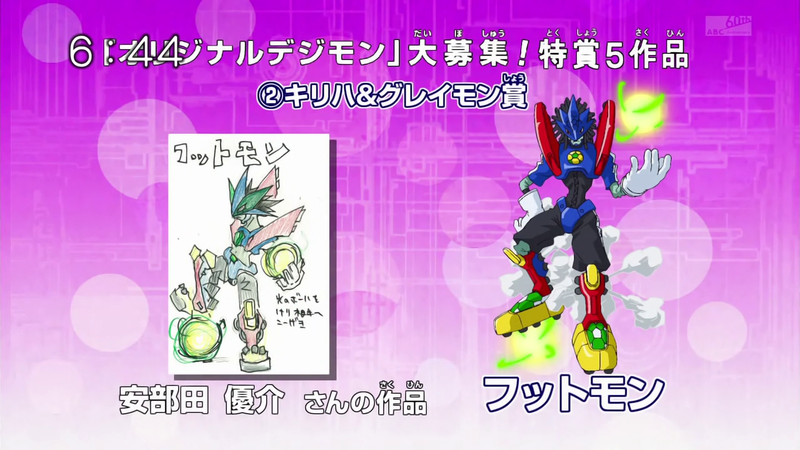 The Birth of Shoutmon DX"
White Skull Knightmon N/A 2012 Digimon Xros Wars: "Xros Songs!! To All The Teens Who Are Chasing After Their Dreams!!" Wormmon ワームモン 2000 Digimon Adventure 02: "The One who Inherits Courage"
Xros Up Arresterdramon (Astamon) クロスアップ アレスタードラモン 2012 Digimon Xros Wars: "All Will Be Revealed Now! The Secret of the Digimon Hunt!" 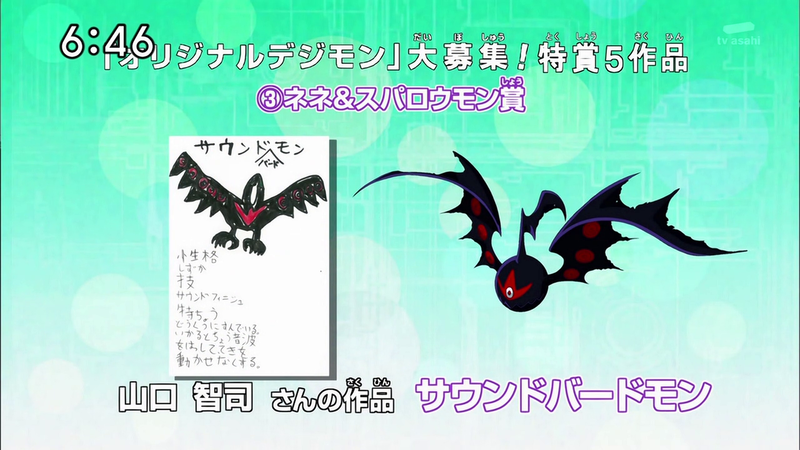 Xros Up Arresterdramon (Blossomon) クロスアップ アレスタードラモン 2012 Digimon Xros Wars: "Resemblance? Or None at All? The Disguised Phantom Thief Betsumon"
Xros Up Arresterdramon (Dobermon) クロスアップ アレスタードラモン 2011 Digimon Xros Wars: "The Digimon Hunt is Thriving! The Virtuoso Hunter of the Shopping District!!" Xros Up Arresterdramon (Metal Tyranomon) クロスアップ アレスタードラモン 2011 Digimon Xros Wars: "The Students Disappeared! The Flickering Shadow of Sagomon"
Xros Up Arresterdramon (Orgemon) クロスアップ アレスタードラモン 2012 Digimon Xros Wars: "All Will Be Revealed Now! The Secret of the Digimon Hunt!" 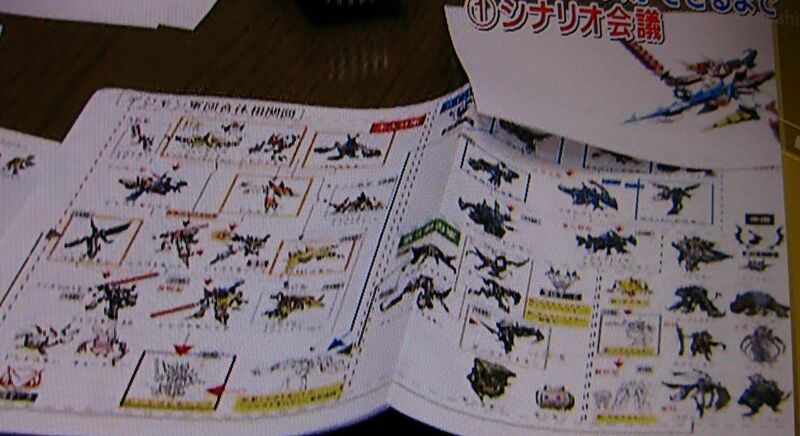 Xros Up Arresterdramon (Sagomon) クロスアップ アレスタードラモン 2011 Digimon Xros Wars: "The Honor Student is Being Targeted! Blossomon's Smile"
Xros Up Arresterdramon (Sparrowmon) クロスアップ アレスタードラモン 2011 Digimon Xros Wars: "Landing in Hong Kong! Protect the Super Beauty Idol!!" Xros Up Arresterdramon Superior Mode (Brave Snatcher) クロスアップ アレスタードラモンスペリオルモード 2012 Digimon Xros Wars: "Burn Up, Tagiru! The Glorious Digimon Hunt!" Xros Up Astamon (Cerberumon) クロスアップ アスタモン 2012 Digimon Xros Wars: "The Gathering of the Legendary Heroes! The Digimon All-star Showdown!!" Xros Up Astamon (Triceramon) クロスアップ アスタモン 2012 Digimon Xros Wars: "All Will Be Revealed Now! The Secret of the Digimon Hunt!" Xros Up Ballistamon (Revolmon) クロスアップ バリスタモン 2012 Digimon Xros Wars: "The Gathering of the Legendary Heroes! The Digimon All-star Showdown!!" Xros Up Dorulumon (Pawn Chessmon (White)) クロスアップ ドルルモン 2012 Digimon Xros Wars: "The Gathering of the Legendary Heroes! The Digimon All-star Showdown!!" Xros Up Gumdramon (Kotemon) クロスアップ ガムドラモン 2011 Digimon Xros Wars: "The Digimon Kendo Match! Kotemon's Blade Draws Near!!" Xros Up Mervamon (Beelzebumon) クロスアップ メルヴァモン 2012 Digimon Xros Wars: "The Gathering of the Legendary Heroes! The Digimon All-star Showdown!!" Xros Up Omega Shoutmon (Dorulumon) クロスアップ オメガシャウトモン 2011 Digimon Xros Wars: "The Students Disappeared! The Flickering Shadow of Sagomon"
Xros Up Opossummon (Candmon) クロスアップ オポッサモン 2011 Digimon Xros Wars: "Beware of the Cuteness! The Cute Hunter, Airu's Trap!" Xros Up Shoutmon (Chibi Kamemon) クロスアップ シャウトモン 2012 Digimon Xros Wars: "Great Undersea Adventure! Find the Treasure of Dreams Digimon!" Xros Up Shoutmon (Pinochimon) クロスアップ シャウトモン 2011 Digimon Xros Wars: "Robot Club's Dream, Pinochimon's Temptation"
Xros Up Submarimon (Plesiomon) クロスアップ サブマリモン 2012 Digimon Xros Wars: "Great Undersea Adventure! Find the Treasure of Dreams Digimon!" Xros Up Tuwarmon (Superstarmon) クロスアップ ツワーモン 2012 Digimon Xros Wars: "The Gathering of the Legendary Heroes! The Digimon All-star Showdown!!" Yaamon ヤーモン 2002 Digimon Tamers: "Dreaming Power is Our Future"
Yakiimon ヤキイモン 2012 Digimon Xros Wars: "Amusement Park of Dreams, Digimon Land!" Zamielmon ザミエールモン 2011 Digimon Xros Wars: "To a New World! The Fire-fury General's Dragon Land"
Zeke Greymon ジークグレイモン 2011 Digimon Xros Wars: "Stand Up, Kihira! The Xros Heart Rescue Strategy"
Zenimon ゼニモン 2011 Digimon Xros Wars: "The Digimon Hunt is Thriving! The Virtuoso Hunter of the Shopping District!!"